This set of Biochemistry Problems focuses on “Fates of Pyruvate under Anaerobic Conditions: Fermentation”. 1. Which of the following is true about the enzyme producing NADH from a triose phosphate in the glycolytic pathway? Explanation: Triose phosphate, glyceraldehyde 3-phosphate is oxidized to 1, 3-biphosphoglycerate in the presence of dehydrogenase enzyme. Explanation: NADH and the ATP/ADP ratio are the major factors determining whether glucose is oxidized by aerobic or by anaerobic glycolysis. 3. When glucose is converted to lactate by anaerobic glycolysis, equivalent number of ATPs derived is? Explanation: 2 ATP molecules are released when glucose is converted to lactate by anaerobic glycolysis. 4. When one molecule of glucose is oxidized to two molecules of lactate during anaerobic glycolysis, which of the following statements is false? Explanation: When one molecule of glucose is oxidized to two molecules of lactate during anaerobic glycolysis, Glyceraldehyde 3-P dehydrogenase reaction does not produce 2 ATP molecules. 5. In the reduction of pyruvate to lactate, which of the following is regenerated? Explanation: NAD+ is regenerated from NADH by the reduction of pyruvate to lactate. Explanation: Pyruvate decarboxylase requires Mg+2 in the conversion of pyruvate to acetaldehyde. Explanation: TPP is a coenzyme derived from vitamin B1 (thiamine). Glucose +2ADP + 2Pi → 2 ethanol + 2CO2 + 2ATP + 2H2O. 9. Enzyme involved in the pathway of ethanol fermentation? Explanation: Decarboxylation of pyruvate is catalyzed by pyruvate decarboxylase. Explanation: In the synthesis of acetyl-coA, pyruvate dehydrogenase is involved. 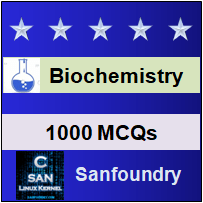 To practice all areas of Biochemistry Problems, here is complete set of 1000+ Multiple Choice Questions and Answers.